"A Martini tastes better when you are wearing heels" opens a recent article I've read by Douglas Blyde. (An impeccably dressed man himself, that I expect, will still be in perfectly pressed trousers sat in front of a Netflix box set binge.) He goes on to say that there's a new cultural shift in dining, away from the exposed brick canteen style dining towards a more elegant, yet modern refinement. I've certainly been craving more ceremony in dining lately and believe that the environment and tone of a restaurant, as well as the implied dress code to an extent, really does makes a difference to your experience. No doubt you'll be arriving in a taxi or car as it's a half hour from Brighton in the gorgeous village of Alfriston, but that's a bonus. No eating quickly and running on to somewhere else, the dining is the occasion here. Your experience of Wingrove House starts from the car park itself, for as soon as you step out you are faced with the elegant terrace (worth coming back in the Summer for) and towards the 19th century colonial-style country house. The smell of log fires and history welcome you at the door but the interior is fresh, luxurious and modern, yet sympathetic with the age of the house. 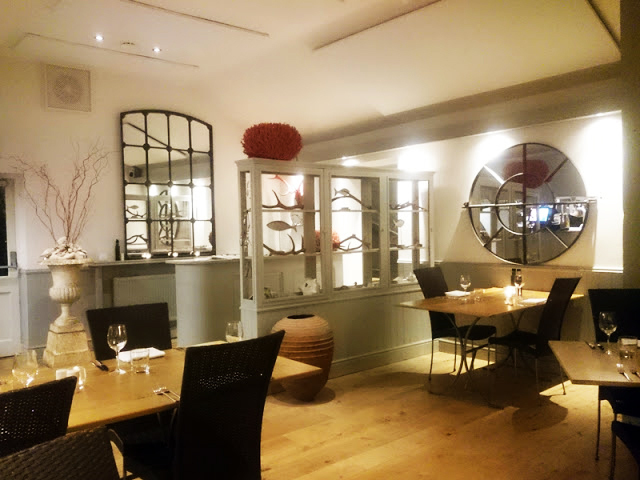 You peruse the leather bound menu in the lounge with an aperitif if you wish (of course) before being taken through to the dining room, a bright, modern space in white with a surprising coral accent. I loved the style and the mood of it. 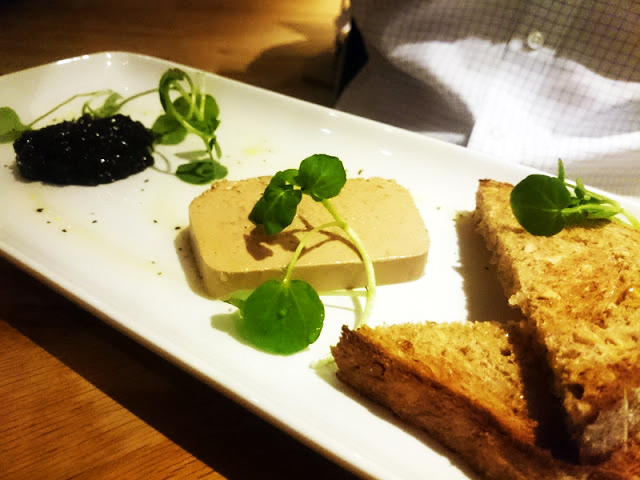 The pate was a refined example, silky smooth and full of flavour with a sharp pickle to contrast. The best part was being given enough toast to sensibly finish it. Not enough restaurants do this! Now we are in the Autumn it's time for heavier meats and game so the venison called. 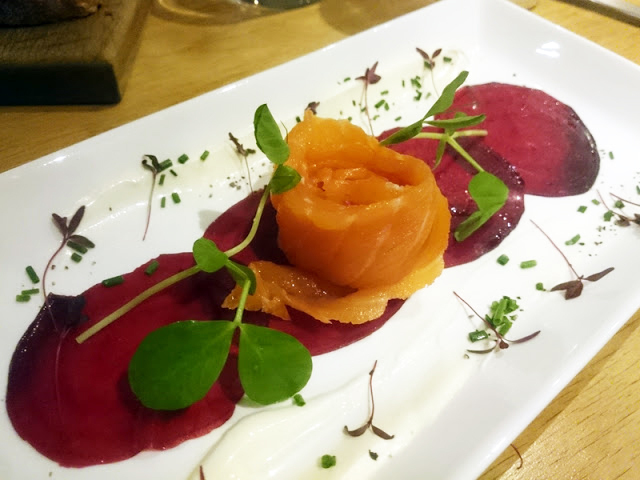 The source of all of the main produce is listed on the menu and the meat was from South Brockwells Farm near Uckfield. Star of the plate surprisingly was the braised red cabbage, softly acidic, warmly spiced and full of juicy blackberries. I almost got nostalgic for Christmas, and I hate Christmas. 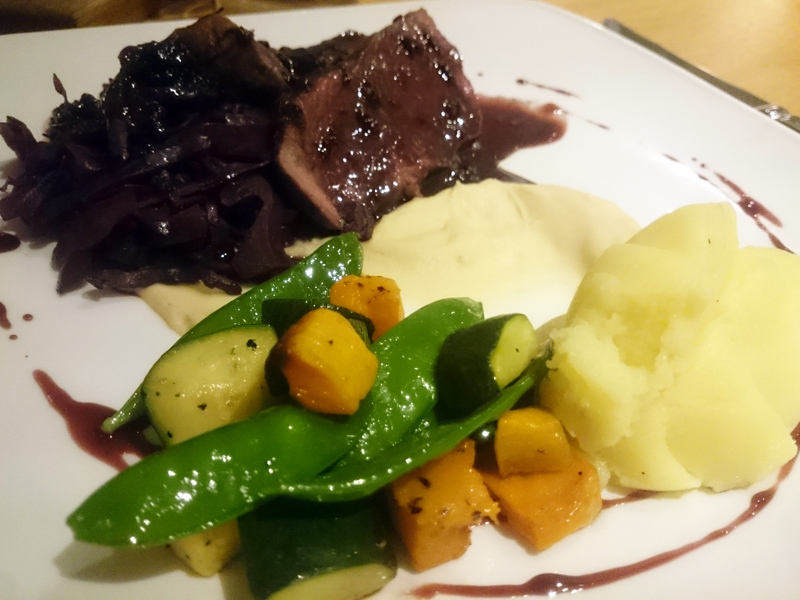 The venison itself could have been more tender, it was cooked to my liking and rested well but just needed a decent chew. Which was fine as it had great flavour. 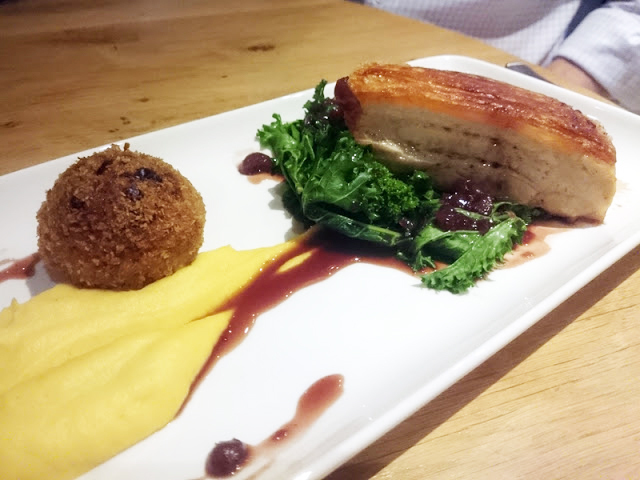 The pork belly special was enjoyable too. I didn't get too much of a taste of it from the husband's plate but he didn't complain at all. The little sage and pork ball was delicious with it. It's rare that I could eat pretty much any dessert on the menu as it's not my favourite part to a meal but I don't know what possessed me to choose the Valrhona chocolate and hazelnut cheesecake. Cheesecake and chocolate are neither of my first choices! 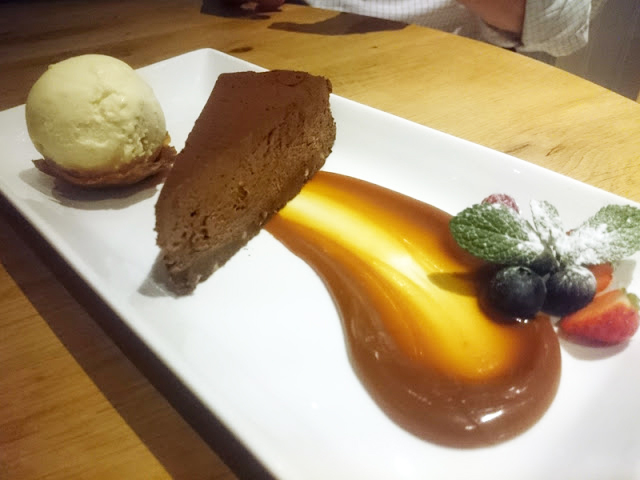 Maybe I was thinking of some brilliance from the salted caramel and banana ice cream as head chef Mathew Comben is formally from the celebrated Hungry Monk in Jevington where the banoffi pie was invented. And it indeed worked together really well although making a cheesecake out of the Valrhona chocolate dilutes the rich, decadent nature of it somewhat. 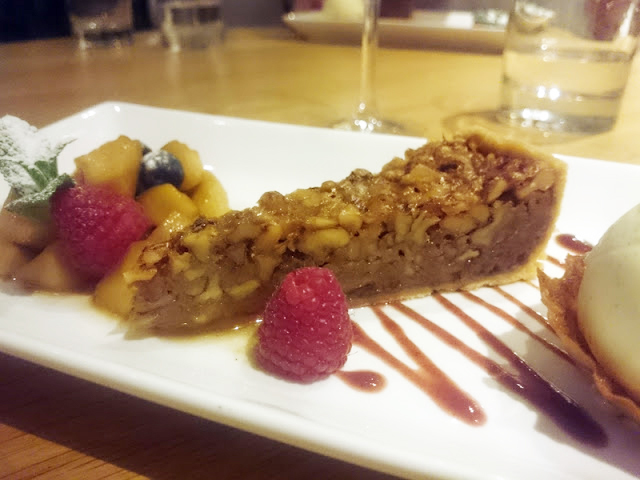 The caramelised walnut and honey tart was more up my street, sweet enough, sticky enough and crunchy enough. The spiced apple compote and simple vanilla ice cream was all it needed for the season. Our meal was all nicely presented and of the quality you would expect. There was a good selection of wines with a sensible price range too. And talking of price, when you think that burgers are hitting the £8 in fast food joints like Five Guys, or even £20 at the i360 (iRoll), the meal here at £35 for three courses is fantastic value. As I mentioned, there is a gorgeous terrace that begs for summer lunching and Alfriston itself is beautiful. I'm embarrassed to admit that I've only been as far as Drucillas Zoo at the entrance of the village, but go beyond that and there's a quaint square surrounded by the glowing windows of the most inviting pubs I've ever seen - think low beamed ceilings and buckets of character. Wingrove House is absolutely worthy of getting those heels out and getting out of town for. The whole evening was the occasion and a very pleasant one too. 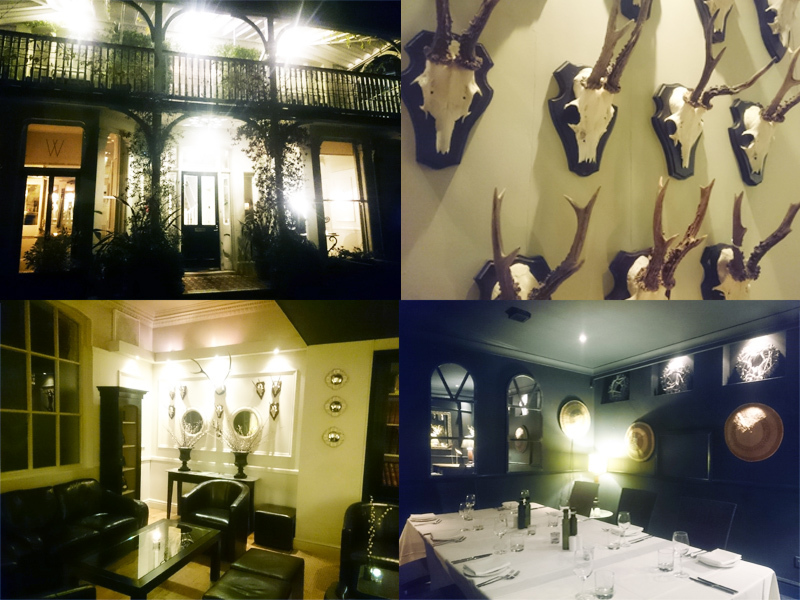 I was invited to review Wingrove House. Words and thoughts, as always, my own.